'cause really that's the best part of a birthday party anyways right? i REALLY wanted to throw a whole bunch of candy up there as well..
but that was just outta my budget this go round. 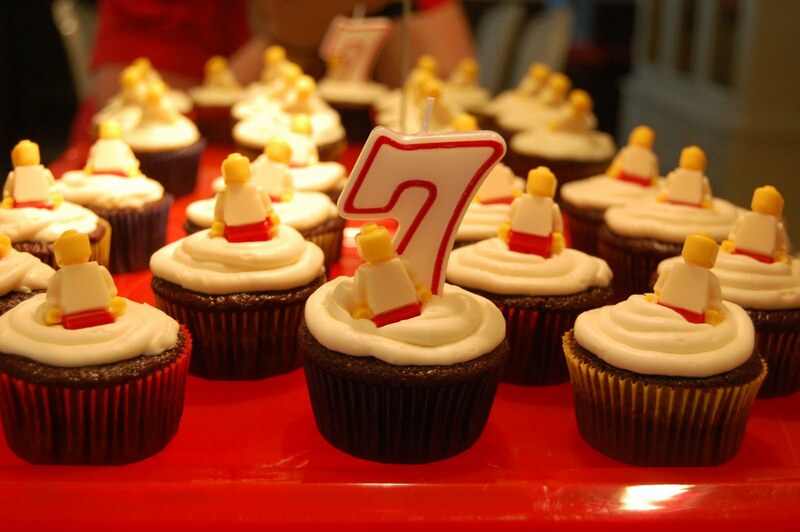 after six birthday parties, i think it's safe to say cupcakes are were it's at for me. i spent probably 20 hours between friday & saturday making soo many other things..
i didn't have the chance to taste test a bunch of recipes. i needed something i knew would work. this silicone minifigure mold was put to good use. for some reason (which seems stupid to me), the US lego website doesn't sell it..
you have to get it on ebay, etsy, or amazon. after some trial & error i found the best way (for me at least) to fill in the mold with different colors. it's not sectioned off well, so it's tricky. first, i microwaved the candy melts in a disposable icing bag.. SO much better than the squeeze bottles, trust me! i just put the bag over the top of a microwave safe mug & started melting them. starting with the shirt.. pipe in a small layer, enough to just fill the bottom of the shirt section. next fill in the pants with whatever color you want. you can put a thicker layer on here, but be careful not to overflow into the hand cavities. next pipe in a dollop on each hand section, as well as the head. after all sections are filled, come back to the shirt portion & put another good sized squirt in the middle. then tap the mold gently on your surface to fill & help any bubbles rise to the surface. thankfully, they only take a few minutes to set up... since i made over 40 & there are only 8 sections! there was no way i was going to get away with NOT making them. truthfully.. they weren't as difficult as i thought they were going to be. i've seen a couple different methods for making them..
but i went with snipping a small piece off the bottom of a regular sized marshmallow..
and snipping off a small piece of a miniature marshmallow..
& the bottom of the small one to stick them together..
then dipped them in yellow candy melts & drained off the excess..
once dry i used black decorator gel to put on the faces. the toughest part was figuring out what i was going to put them in to keep them upright. problem solved when my grandparents came to visit & brought mason an early birthday present! 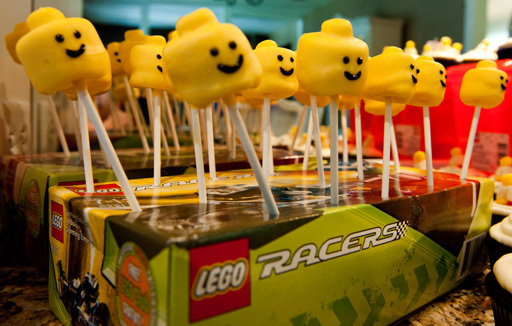 i used two lego racers boxes, poked holes in them first with a metal skewer..
& then stuck in the lollipop sticks! next up... the lemon minifigure gummies. again i used the minifigure molds. got the idea from modern moments design via tipjunkie. 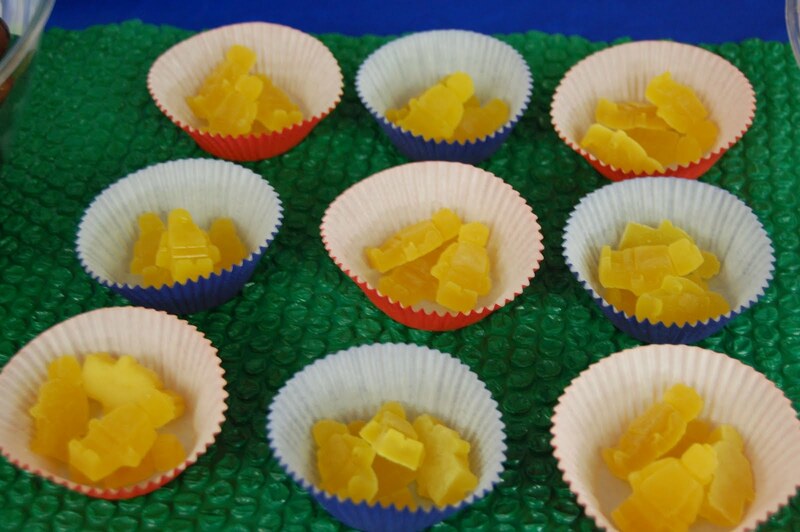 they turned out good, but a little chewy for our taste, so i think we may decrease the amount of gelatin next time. it was fast & messy, so there are no pictures. the mixture is hot & sets fast, so there are no pictures. 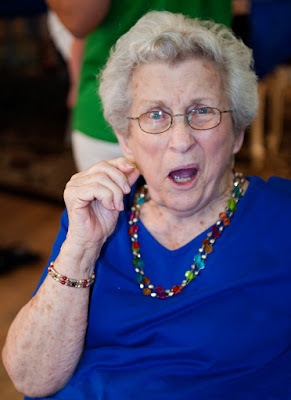 they were a big hit with the kids though my oma didn't like them so much! that's her gummie eating face :) haha! i tried my hand at the cookie cupcake. i just used the nestle toll house chocolate chip recipe & substituted in mini m&m's for the chocolate chips. wouldn't you know it i picked to take a picture of the only one without m&m's in it?!?!?! of course i didn't realize it until i uploaded the pictures!! again, they had store bought icing..
but even they were a hit. my uncle mike snagged two before i could even get them put up for the next day! and who knows.. maybe i'll tell you how much i spent. for the lego birthday overview post click here. Wow! What an awesome mama you are! Everything looks great! Those cookie cupcakes look fabulous! Love the party! 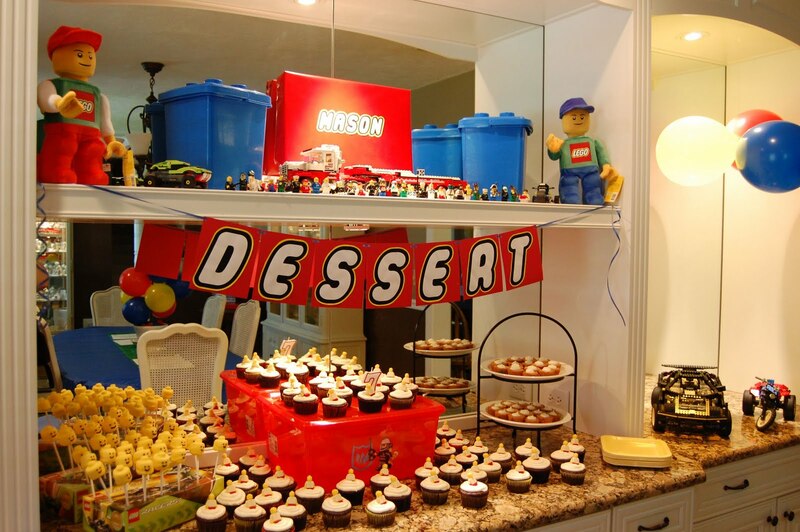 Hi Kristy, Thanks for sharing your party. I bought our lego molds the other day from ebay, and I was planning on doing just one color...but now you have inspired me to use multi colors!!! So MUCH cuter!! !